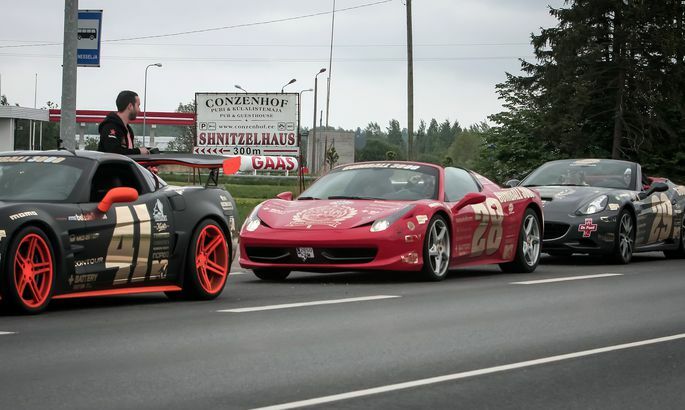 Elustiiliralli Gumball 3000 osalejate seltskond. In initial six months of the year, 45 luxury cars have been bought in Estonia – just two short of total sales for 2012. Luxury vehicles sold best while Estonia was in its years of boom. Back then, sales figures rose to heights definitely out of reach in near future, say sellers. As economic crisis hit, the whole market shrunk – while in 2007 a whopping 30,902 new cars were sold according to Estonian car sellers union AMTEL – 219 of these luxurious – 2010 was languishing at 8,848 and 30, respectively. In Europe, luxury vehicles are assessed at 0.2 percent of car market. The booming Estonia had it up at 0.7 percent. These past years, we have managed to stay in the 0.3 to 0.4 percent brackets. According to Lemmo Tigane, marketing manager for Auto100 equipping Estonia with Porsches, Bentleys, Lamborghinis and Lotuses, the sales have not recovered compared to the boom. Even so, starting 2011 the trend is positive again. «Lately, lots of buyers have popped up with a definite budget within which a compromise will have to be struck between desires and means i.e. there’s the clients who are moving up the ladder, so to speak, when buying a new car. Naturally, the trend reveals a gradual growth in their financial confidence,» explained Mr Tigane. According to him, the main luxury buyers are the diligent and successful Estonian employers. As underlined by AMTEL chief Arno Sillat, we need to specify that a luxury car isn’t any «big and black saloon» as is popularly thought. Rather, the car segments are of a definite nature and each model has its place. In the EU, luxury mainly falls into the F-segment, dominated by the German top-notch wheels. For instance, popular models would be Audi A8, Porsche Panamera, BMW 7th series and the Estonian favourite, Mercedes Benz S-class. Silberauto's Mercedes-Benz sales director Toomas Kreek said the new S-class has had a mighty impact on this year’ luxury sales in the land. On the local luxury car market, a lot depends on the new models rolled out – for the next year, he is not predicting too much growth. «So this will not be about consumers becoming more down-to-earth; rather, it’s the specifics of the luxury car segment,» he added. According to Mr Sillat, buyers are becoming more reasonable, sober and sound when considering their options – not limited to looking at the price tag, they thoroughly look into running costs, the possible residual value as the term of use expires, and the car’s characteristics as related to using it. «Usually, emotions take the back seat, but they do still have a place,» commented Mr Sillat. According to him, the overall trend is towards reasonableness: ever since the recession, luxury car percentage has been going steadily down the hill. The AMTEL head says Estonia is headed towards the European average – the main difference being that over here, now and probably in the future, the mini car proportion will be lower. «Most of us can’t afford the second and third car in the family yet, while in Europe that’s what the mini-cars are for,» said Mr Sillat. Increasingly, car buyers are also interested in little-used vehicles. According to Mr Tigane, Porsches are on the rise in the used-car market – thanks to the emergence of decent servicing. «There are fewer such clients who buy a new car from Germany as a matter of principle,» he added.